This continues my experiments with Vue d'Esprit's "Planetary" mode. Basically you can move the camera high enough that you are looking down at the entire planet that you were working on. The planet in "Skyward" was made in this manner, but I wanted to see if I could use it to create a gas giant type world. I love the simplicity of this one, it's very reminiscent of your older work. The planet's beautiful too, like it's been pastel painted. Sorry about that! I will re-upload the file right away. "5120x1600 is reporting errors viewing it"
Trying to load the 5120x1600 and Firefox is telling me it cannot display the image because it contains errors! "7 on the Single & 9 on the Multi"
Request for Ryan. Can we have a single screen view like there is for the multi-screen? I absolutely love the zoomed in view for the multi-screen, I think it would look beautiful on my phone the only bad part its not available on the DB app. is this supposed to be a gas giant? Because if so I'd have to say the clouds look a little too hard and angular, there doesn't appear to be much circulation, especially on the pickle jar version. 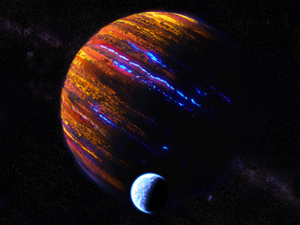 However, if this is supposed to just be a really unique planet with a multi-colored mountain ranges and valleys that happen to appear in stripes (which calls up all sorts of possible incredible cosmological/geological explanations in my mind) then awesome! If Gas Giant I'd give it a 7, if the latter I'd give it a 9. Certainly better than the first version, ad the whole planet feels softer, but the clouds still come across as rocks to me. Maybe my high definition graphics have pampered me too much. I thought the single screen render was pretty darn cool, but I just don't dig the multis. I guess they're just too different to maintain the same feel. Cronus Rising? Go for it, Ryan! You don't need our permissions. You create, we criticize. You seem to be in sync with the Cosmos. Curiosity just had its first Martian birthday while you are working on a red planet called Cronus. Keep up the interstellar good work! While I do like the clouds of the second version better, I miss the stars. I also wish the moss was visible in the multiscreens since that is what I use on my desktop. I love the improvements of the atmospheric haze and color, but I think I liked the planet having a star field on the first version. It felt like it was in some sort of context rather than isolated (which I know is technically more accurate given astronomical distances but still). If I recall Ryan was once invited to do conceptual work for NASA but he declined to stay dedicated to his fans. His work may not be totally realistic but like you alluded realism can be boring. Now the clouds look more cloudy. Much better! Like this one a lot-- I'm a big fan of your planetscapes. Kind of reminds me of Indra. I'm also really excited to see what you can do with the aforementioned cloud-layer-level renders! Okay, this one really is awesome now. I like the smoother atmosphere haze in the "mid-day" portion of the planet, but you can still get to see the chunkier 3D in the "evening" area of the scene. I like the way the clouds of the gas giant seem to be three dimensional. Is the title "Cronus" somehow weakly referring to the Klingons? You can do no wrong when it comes to planetscapes Ryan. Can't wait for the multi. I've added a new version of "Cronus" this morning. I've flattened the clouds a bit and, as suggested, added some haze to the atmosphere. Still, this is meant to be a fanciful gas giant (and it's my first) so I don't mind sacrificing realism in that pursuit. The main benefit of this new version is that the gas giant is all one, raw, render. The first version was actually a Photoshop composite of 2 different renders. My main goal is always something that I can re-render without Photoshop and this version satisfies that nicely. The name was taken from one of my first Bryce planetscapes. I think an updated "Cronus Rising" may appear sometime in the not-too-distant future. Another benefit of this 3D approach to planet-making is that I can move my "camera" down into the cloud layers themselves for some very interesting views. Stay tuned! If I cared about realism, I'd have a picture of Jupiter on my desktop. This is a really cool image. I love the layering and colors used in the image. Great work! I agree with others that the lumpy cloud layers aren't what a gas giant looks like, but as a piece of artwork I think the depth really adds something - keep them in! It is fairly simple to create a "flat" gas giant using 2D textures. I've done hundreds of them. 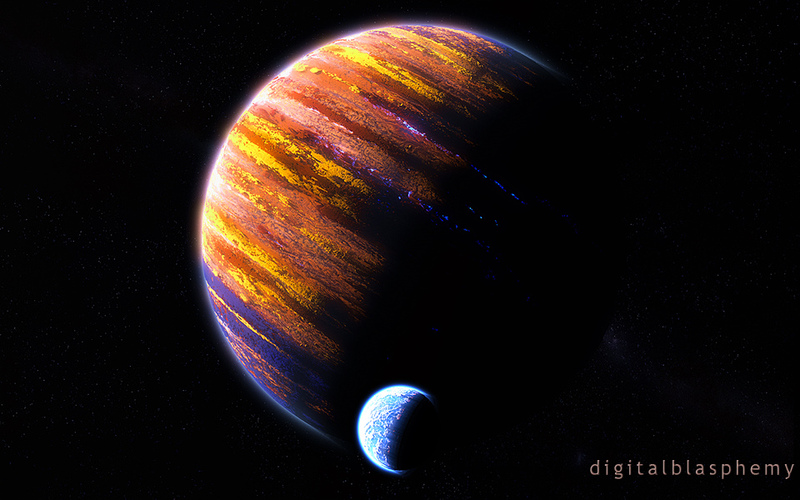 For this piece I wanted a gas planet where you could see all the different cloud layers in "3D". The lumpiness is intentional but I will try to smooth it out a bit in v2. I have to agree with Duke, if you look at most gas giants, the surfaces look almost polished, like billiard balls. The surface here looks almost rough, like oxidized metal in some places. The gas giant is too lumpy. The clouds (?) look like canyons. Gas giants are massive enough that their gravity smooths them out completely on the visible "surface". This looks like a really weird rocky planet. Finally beautiful planets ... I love your planets ... If you add a space ship then its heart hit for me. As a child I collected such scifi cards. "I'd give it a 6.5..."
I like it, but the colors are too separate. Maybe a bit of haze over the atmosphere to blur it a bit? Or maybe some aliasing at the edges so the transition between the colors isn't as sudden. I think that if you added more atmosphere to the gas giant, it will smooth out an look a little less "chunky", like Jupiter. Not bad. a little more texture than I think a gas giant really has, but over all nice.